The coating I put on this red salmon, made it taste rather rich, and teamed with the bean pilaf, it was a very enjoyable, healthy meal. I always buy salmon with the skin on as I find it cooks better and does not fall apart. The meat easily separates from the skin when cooked. Preheat the oven to 220°/200° fan forced, and put some baking paper on a baking tin. Brush the salmon, skin side down, with ½ tbsp of the oil and put the salmon on the baking paper. Mix the garlic and salt into a paste with a fork or knife, and combine this in a small bowl with the mayonnaise, mustard and a bit of the pepper. Spread this mixture on top of the salmon. Bake the salmon for about 7 - 8 minutes or until it flakes easily with a fork - do NOT overcook. Meanwhile, heat the remaining oil in a large pan and add the beans, lemon zest, pine nuts and a bit of pepper. Cook, stirring until the beans are JUST tender - about 4 minutes. Reduce the heat to medium and add the rice and cook for about a minute or two. Serve the salmon on top of the bean pilaf - a healthy and nourishing meal! Does AFL football interest you? 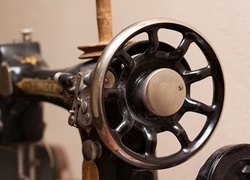 Have you seen or used one of these old Singer sewing machines?